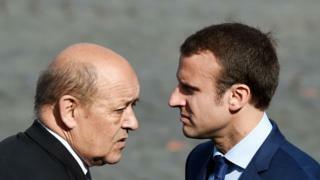 Socialist French Defence Minister Jean-Yves Le Drian has announced his support for centrist Emmanuel Macron instead of his own party’s presidential candidate. Mr Le Drian said the move was necessary because victory for far-right leader Marine Le Pen in the forthcoming election would be a “danger to France”. He is the most senior government member to endorse Mr Macron so far. The latest polls suggest Mr Macron and Ms Le Pen are neck and neck in the first round next month. She had been projected to win the first round but then lose a run-off vote. Socialist Benoit Hamon – who won a primary of left-wing parties in January – said Mr Le Drian’s decision “did not respect voters of the left”. It comes after two junior ministers – Barbara Pompili from the Green party and Thierry Braillard from the Radical Left party – said they would support him. Mr Hamon has also failed to win the backing of former Prime Minister Manuel Valls, whom he defeated in the primary. Polls suggest Mr Macron – a former economy minister under President Francois Hollande who is seeking the presidency as an independent – would win 26% of the vote in the first round. He is just in front of Ms Le Pen – who leads the National Front – on 25% and scandal-hit centre-right Republicans candidate Francois Fillon is some way behind with 17%. Mr Fillon was previously favourite to become France’s next president but his support has fallen after he was put under investigation for hiring his family. The probe has since been widened to include possible forgery and aggravated fraud. The first round of voting is on 23 April with the second round two weeks later on 7 May.